Safari, Apple's web browser, has supported multi-window and tabbed browsing for some time, but many of its users aren't quite sure how to control when or how tabs or windows are created. You can always right-click on a link on a page and, from the pop-up menu, select the option to open the link in a tab or new window, but this can be cumbersome at times. Here's an easier way to do it. Open a New Tab (Command + T): Opens a new tab with a blank page. Switch to Next Tab (Control + Tab): Moves you to the next tab to the right and makes it active. Switch to Previous Tab (Control + Shift + Tab): Moves you to the tab to the left, making it active. Close Current Tab (Command + W): Closes the current tab and moves to the next tab on the right. Re-Open Closed Tab (Command + Z): reopens the last closed tab (this is also the general undo command). Open a Link in a New Background Tab (Command + Click): The link will open in a new Safari tab in the background, keeping the current tab as the active tab. Open a Link in a New Foreground Tab (Command + Shift + Click): The addition of the shift key to this shortcut causes the newly opened tab to become the focus of the Safari browser. Open a Link in a New Background Window (Command + Option + Click): Adding the option key to this shortcut tells Safari to perform the opposite of the tab preferences setting. In this case, instead of opening a link in a new background tab, it will open in a new background window. Open Link in New Foreground Window (Command + Option + Shift + Click). Simultaneously press and hold the command, option, and shift keys, and click the link to open it in a new foreground window. 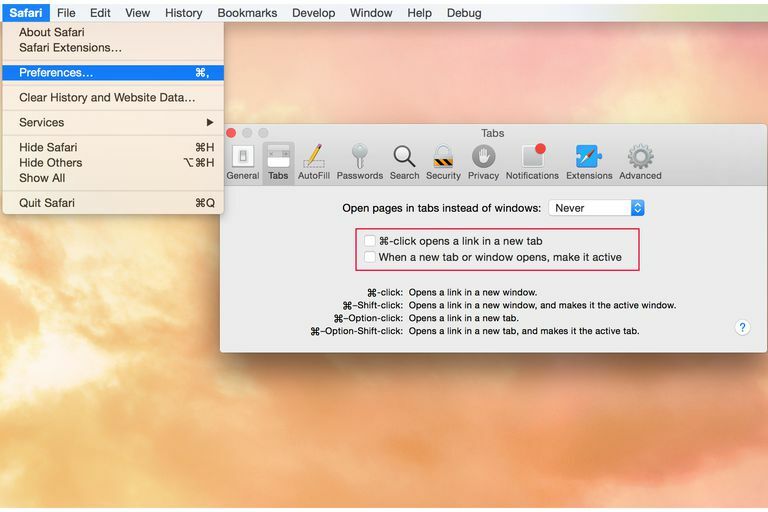 Open a Link in a New Background Window (Command + Click): The link will open in a new Safari window in the background, keeping the current window as the active window. Open a Link in a New Foreground Window (Command + Shift + Click): The addition of the shift key to this shortcut causes the newly opened window to become the focus of the Safari browser. Open a Link in a New Background Tab (Command + Option + Click): Adding the option key to this shortcut tells Safari to perform the opposite of the tab preferences setting. In this case, instead of a link opening in a new background window, it will open in a new background tab. Open Link in New Foreground Tab (Command + Option + Shift + Click). Simultaneously press and hold the command, option, and shift keys, and click the link to open the selection in a new foreground tab. Scroll Up or Down Line-by-Line (Up/Down Arrows): Move up or down a web page in small increments. Scroll Left or Right (Left/Right Arrows): Move left or right on a web page in small increments. Scroll Down By Page (Spacebar) or (Option + Down arrow): Moves the Safari display down by one full screen. Scroll Up By Page (Shift + Spacebar) or (Option + Up arrow): Moves the Safari display up by one full screen. Jump to the Top or Bottom of a Page (Command + Up or Down arrow) Moves directly to the top or bottom of the current page. Go to the Home Page (Command + Home key): Goes to the Home page. If you didn't set a Homepage in Safari's preferences, this key combination won't do anything. Go Back to Previous Web Page (Command + [ ): Same as the Back menu command, or the back arrow in Safari. Go Forward a Web Page (Command + ] ): Same as the Forward menu command, or the forward arrow in Safari. Move Cursor to Address Bar (Command + L): Moves the cursor to the address bar with the current content selected.